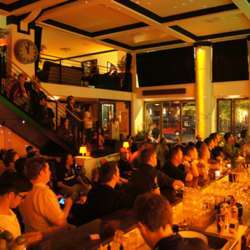 Lets meetup earlier before the comedy for some drinks and conversation at this lovely little bar in Mitte. Everyone is welcome, even if you are not planning to come to the English comedy show from 9pm, you are welcome to just join us for a few drinks and some lovely conversation at the bar. This bar is non-smoking with a separate smoking room upstairs.